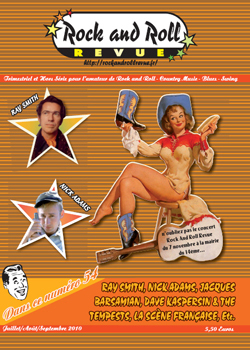 Thank you Bernard Boyat and Rock and Roll Revue. Picture the scene: it’s 1958 in Rochester, New York. A young rockin’ guitar picker named Dave Casperson is handing out business cards to promote his band. 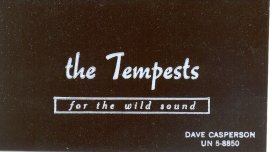 They boast, ‘The Tempests - For the WILD SOUND!’ And they weren’t lyin’! ‘We named ourselves The Tempests because we played like a wild storm!’ exclaimed Casperson, who reverted to the original Norwegian spelling of ‘Kaspersin’ in 1983. Today Kaspersin and his original Tempests aren’t the wild bunch they once were. But in their minds the memory lives large. Before finding fame with the Young Rascals, Gene Cornish played a role in the Echo-Tron/Tempests saga. ‘Gene was trying to make it and his family had money, so I hated him,’ declared Kaspersin. ‘Once at a park pavilion hop we (The Echo-Trons) had done everything we knew twice - we were doing strictly instrumentals at the time. A band - Gene Cornish and the Satellites - was making fun of us. The Echo-Trons broke up in 1958. 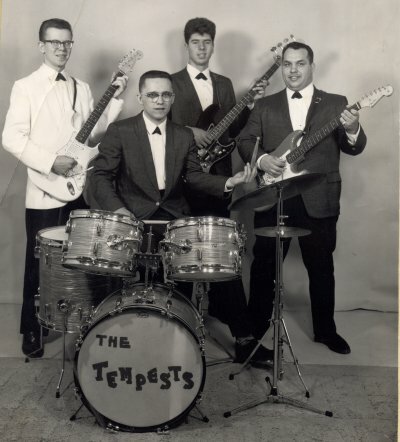 The Tempests then formed around the nucleus of Kaspersin (lead and rhythm guitar, vocals and screams), Ken Stewart (rhythm guitar, vocals and screams), and Jim Herney (bass and backing vocals). After going through a few drummers whose names are lost in the mists of time, the band settled on Jim Collins. To this day Kaspersin applauds Collins as one of the best drummers he has ever worked with. The Tempests practiced literally anywhere they could find. They used the basement of the Kaspersin residence until, according to Dave, ‘My dad had enough.’ Next, they talked the owners of a local bowling alley into letting the group use their banquet room. When they got thrown out of there, they commandeered a huge garage where Ken Stewart happened to work. ‘It had great reverb!’ recalls Kaspersin. 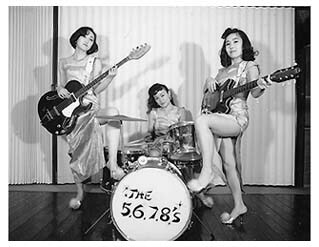 Live gigs found the Tempests performing at high school dances, radio station sock hops, bars (once they were old enough), gas stations, pizza parlor openings, weddings and frat parties. Kaspersin remembers the frat parties with particular fondness, ‘Many of them were just like ‘Animal House!’’ At a gig at Cornell University the band got a chance to meet their hero, Bo Diddley. ‘I had every album he ever did,’ said Kaspersin. The actual split occurred when Tatlock’s wife Gloria made him quit. ‘We were at the Mapleleaf (aka The New York Night Club) on Ridge Road in Rochester and they had a go-go stage,’ said Kaspersin. ‘We shared the same dressing room with the girls and Gloria didn’t like it. She actually started a fight with one of the girls and pulled her hair out.’ Later, the aforementioned Gloria turned Tatlock’s guitar into a planter, which may have been a factor in their subsequent divorce. Kaspersin started a new combo right away and continued to perform at The Mapleleaf. But the project, dubbed The Main Object, just wasn’t the same. Kaspersin cannot even remember the names of the participants. ‘I think I had become burned out,’ he admitted. After they parted ways, some of the former Tempests stayed in music. Ken Stewart appeared all over the country, billing himself as ‘The California Troubadour.’ He still plays the occasional solo gig. Jim Collins got involved in country music, although he currently works in the vending and gaming machine industry. Lee Tatlock is in a band with his son. They recently did some recording behind Dave Kaspersin. Dave Kaspersin stayed in music. He bought out Les Osband’s Lifetime Records operation, eventually starting up his own studio, Dynamic Recording, circa 1974. He runs a record label and has produced over 300 albums for various artists over the past 10 years, in addition to thousands of demos. He runs the enterprise in partnership with his wife, Jackie. 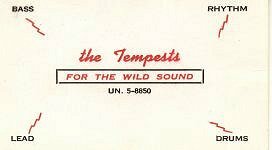 The Tempests’ ‘Rockin’ Rochester U.S.A.’/’Lemon Lime’ single stands out in an era dominated by much softer sounds. The fact that such a wild disc saw the light of day in 1960 attests to the band’s determination to capture themselves the way they really were, commercial consideration be damned. Judging from the recorded evidence, the Tempests were indeed one hell of a rockin’ combo. Dave Kaspersin’s email address is: drk@dynrec.com. You may peruse his Dynamic Recording site at http://www.dynrec.com. Dynamic DRK CD-150 Tramper’s Dynamic Christmas 1995 (3-CD set, includes ‘Scarlet Ribbons’ by Dave Kaspersin). Compliments of Mike Murray "Whole Lotta Shakin' Radio Show"